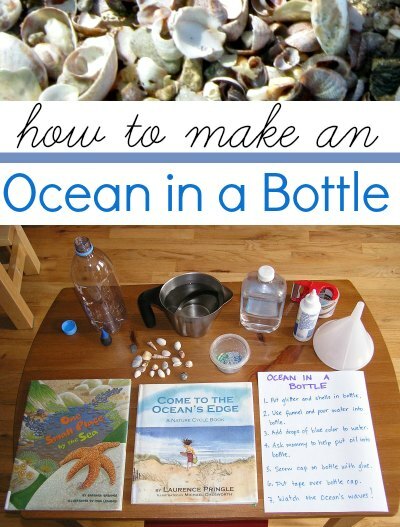 Today we made an ocean in a bottle! As you know, I’ve been preparing some after-camp activities for my son to keep him busy while his brother naps. Since we had so much fun with watercolor pencil seashell art, we are continuing with the seashore theme. As you can see, books about the sea were an important addition! 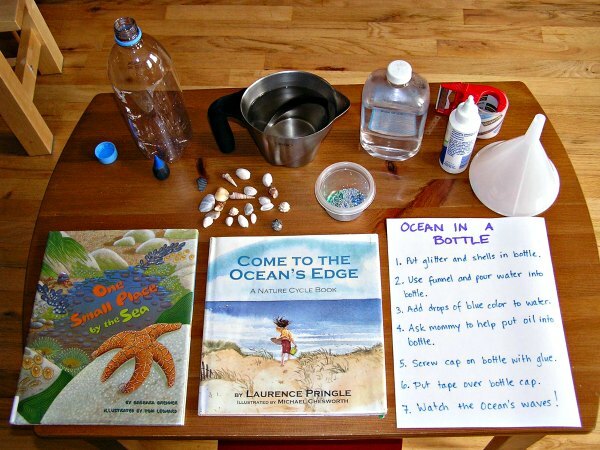 Put glitter* and shells in plastic bottle. If you haven’t been to a beach lately, you can get tiny seashells here. Use funnel and fill bottle half-full with water. Add a few drops of blue and/or green coloring. Pour oil in bottle an inch or so. 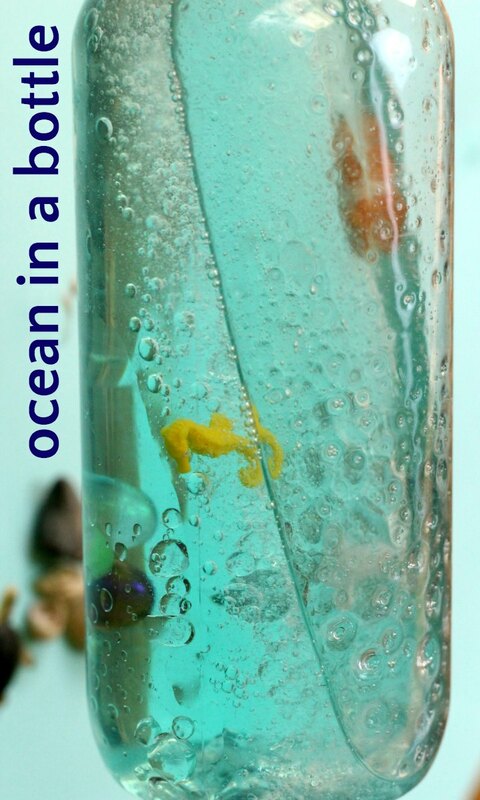 clear oil like this is best, otherwise your ocean will be a bit yellow. Swish bottle back and forth to watch the waves! *Note: I no longer suggest using glitter. Glitter is tiny pieces of plastic that eventually ends up in the tummies of birds and sea life. For more SUMMER FUN check out this fantastic Summer Activities resource. I love this idea! Thanks for giving me ideas this summer! I’m glad you like it. Have fun! my gransons teacher suggested your web site , for my 5 year old. BRILLIENT !!!!!!! If your baby oil is mineral oil, then yes. We have a snow day today. One of my son’s assignments is to create a model of a habitat. We have all these supplies right here at home to make this. Thanks for posting!